The Langley Rivermen finished the pre-season undefeated, beating the Powell River Kings 9-7 at the Langley Events Centre on Sunday. Both teams showcased their offensive talents as well their physicality. The game saw countless penalties, fights and ejections. The Rivermen were led by forward Erik Udahl, who scored two goals. Henderson and the rest of the Rivermen coaching staff will finalize the roster later this week and narrow it down to the league maximum, 22 players, by Friday. After Bo Didur got the start in net against Surrey in Fridayâ€™s 3-1 victory. Darren Martin was between the pipes for the Rivermen Sunday afternoon, giving up seven goals on 34 shots. 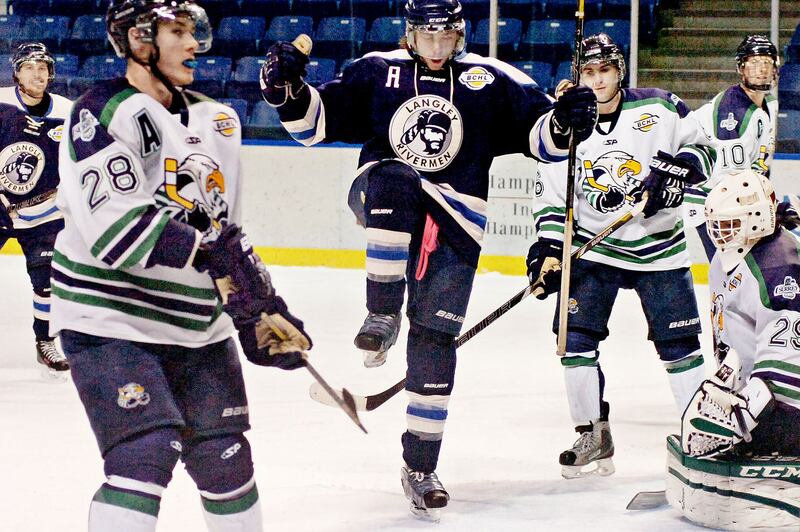 Powell River was led by second year forward Jarid Lukosevicius, who scored twice in the defeat. Lukosevicius led the Kings in scoring last season. Despite his team going 4-0 in the pre-season, Henderson is not reading too much into it. The Rivermen begin the regular season this Friday when they play Salmon Arm at Prospera Centre in Chilliwack, as part of the Bauer BCHL Showcase. Langley will play their first four games away from home before hosting Nanaimo on Oct. 4 at the Langley Events Centre.